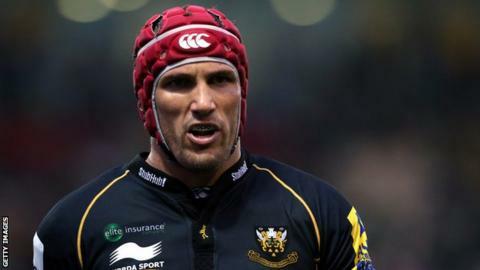 Northampton Saints lock Christian Day has said he almost walked away from rugby before joining the club five years ago. The 30-year-old resurrected his career at Franklin's Gardens after playing with Sale and Stade Francais. "I was at Sale for seven years and had a lot of success there," he told BBC Radio Northampton. "I came to Northampton at a crossroads in my career. I came close to stopping playing to tell you the truth." An academy product at Sale, Day played 66 Premiership games for the north-west club, but was allowed to leave for France after making just six replacement appearances in the 2007-08 campaign. He lasted just a few weeks with Stade Francais, featuring in the Top 14 twice, before finding his form once again with Saints, where he has flourished under the tutelage of forwards coach Dorian West. "I've developed massively here - all credit to Dorian West in particular," said the forward. "I can't see myself moving anytime soon, I love playing for the club and representing the region and I'm proud to do so." Saints host Newcastle in the Premiership on Saturday lying second in the table and England Saxons international Day has said the squad are on a high after a visit from club legend Buck Shelford. The former All Blacks captain was part of the Northampton side that finished runners-up in the 1991 Pilkington Cup (now the Anglo-Welsh Cup) - the club's first ever major final. "He's a real personality. He wasn't at the club for that long but the impact that he had, getting the club on the first step of the ladder, was massive," he said. "To have the captain of the All Blacks playing for you is pretty inspiring. Some of the guys will hopefully be inspired to try to emulate what he's done and hopefully be remembered the way he was. "But there are so many players here who've been around here a while. There's an orderly queue if you want to be a Saints legend."